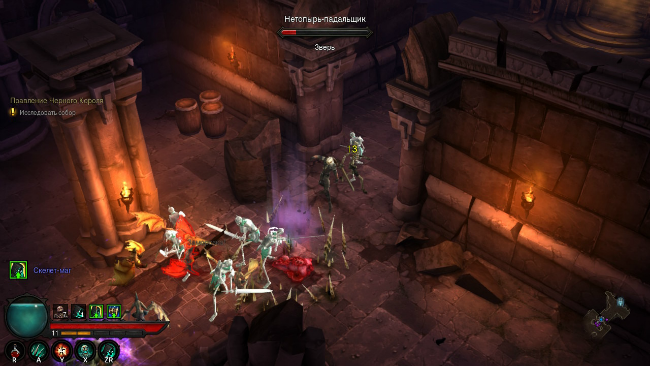 Over the past six years, Diablo III has come a long way from the basic version for PC , which disappointed fans, to a completely redesigned multiplatform edition that takes into account the wishes of fans of the series. Refusal of doubtful decisions of the original release, new loot system, new character, new levels of difficulty and more variable fights along with an additional storyline campaign allowed the project to shine with new colors and become truly popular. 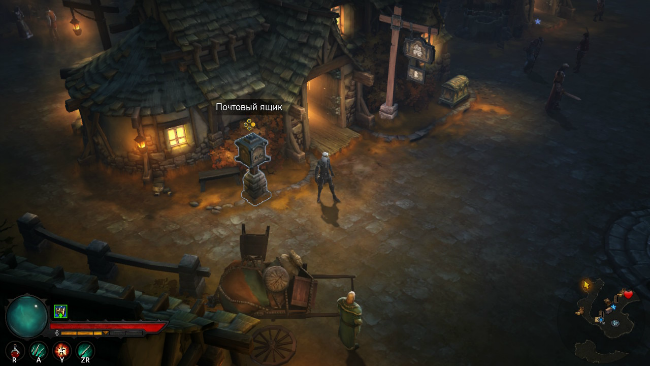 But Blizzard did not stop there and continued to update the game, adding fresh gameplay elements and solutions. 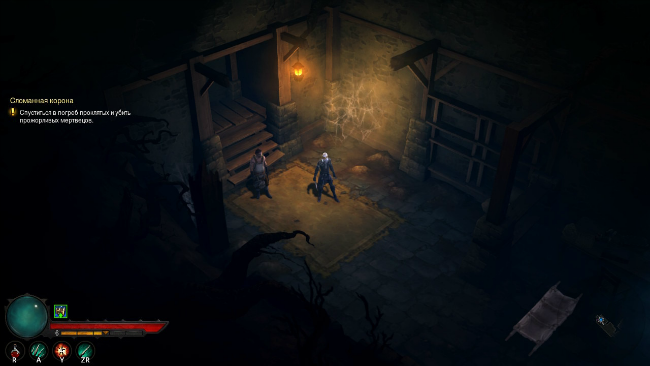 Last year, the company introduced Diablo III: Eternal Collection, which will be on the Nintendo Switch very soon – on November 2, 2018. Iterations to the first hybrid console and is dedicated to this review. 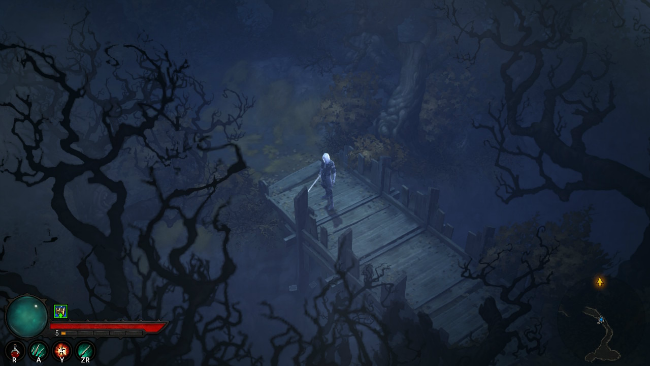 Diablo III: Eternal Collection for Nintendo Switch is a full version of the popular role-playing game with all released updates, story campaigns and characters. From the very beginning, seven classes are available to users: a barbarian, a crusader, a demon hunter, a monk, a necromancer, a sorcerer and a sorcerer in the male and female versions. 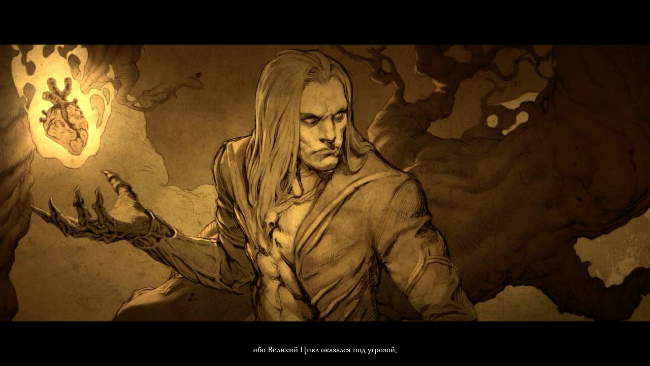 Each character has its own unique fighting styles, skills, appearance and character. Some people prefer melee combat, some prefer remote attacks, but the game is so flexible that you can change their roles, adjusting the gameplay to your personal tastes and needs. It is quite natural that the most interesting for us was the necromancer added in the last major addition, who can summon bone peaks from the ground, send ghosts with magical attacks and have a personal army of skeletal knights. A pale warrior of a gothic appearance possesses one very important skill that works in the manner of Halo: Combat Evolved plasma grenades , making it possible to undermine the corpses of fallen enemies, creating deadly chains of detonating flesh. It effectively destroys crowds of enemies and beautifully spreads the cute interiors and elements of ancient architecture into pieces. Moreover, such combos allow you to quickly get additional buffs, which will be very useful during meat raids in the next dusty dange, which is why playing for the necromancer is really very fun. 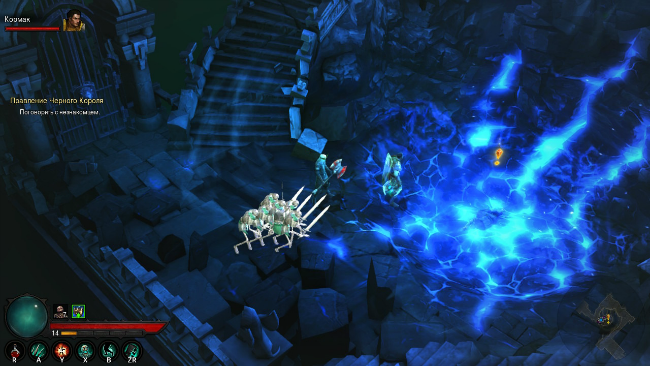 As you level up, you will discover new abilities that, together with equipment sets, allow you to create unique versions of necromancers, designed for both long-range and melee combat, as well as support for partners to pass together. The cooperative reveals the mechanics to the maximum, allowing you to feel the teamwork with the tactical division of roles on the battlefield. Of course, there is also a game mode online and on a large TV, but the version for the Nintendo Switch especially pleased us with the possibility of playing on a single screen in a portable format for up to four people, using, for example, one joystick each. Passing Diablo III this way turned out to be very convenient and simple: you can transfer one of the unique Switch joysticks to a friend who, after quickly redefining the controllers, can use an existing profile, create a new one or use a temporary guest account. If the profile does not have a purchased network subscription, then you can switch to offline mode. Even despite the reduced number of buttons when playing with one joycon, all game features, except dodging, remained. Minor features, such as quick access to newly selected equipment, a portal to the city, and menu settings, are automatically reassigned to combinations with a click on the analog. The loss of somersaults when playing on one joikone looks like a strange decision, considering the unused L button (or R, if you took the right controller). But in fact it does not greatly affect the impression. In any case, when playing together in portable mode on one screen, you can use both the PRO controller and two joysticks at once – in this case, these players will even have a dodge. 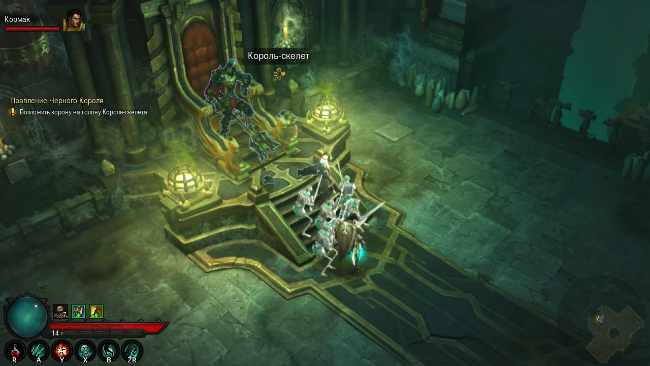 In addition, Diablo III: Eternal Collection for Nintendo Switch has a local multiplayer that allows you to play with friends who have their own console in the same room next to you. But in this case, you will have to manually turn on the local mode, which will disconnect the game from the network and make the rating tables temporarily unavailable. It is also worth noting that Diablo III now and then adds to the character in the squad certain NPC with its attacking skills. Even if you forget about the army of skeletal helpers when playing for a necromancer, you will not be lacking in the company anyway. Held Eternal Collection in portable mode alone, holding hands console, very cool. This is an ideal project for traveling, business trips, playing in public transport or even at night under a blanket. 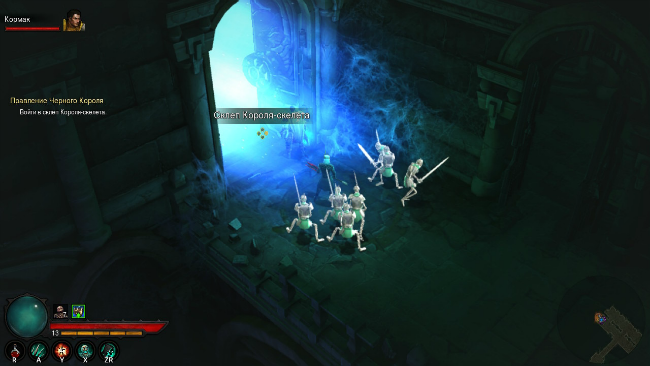 This format with the ability to quickly interrupt the gameplay by switching to sleep mode, and then continue from the same moment, but at the next break, successfully combines with the grind, so cleaning the dungeons, knocking out valuable loot, on the Nintendo Switch is really convenient and positive. And, of course, from the very beginning you can choose any type of transmission, including the usual and heroic, as well as their seasonal counterparts. In the last two cases, you can get unique rewards for your characters. 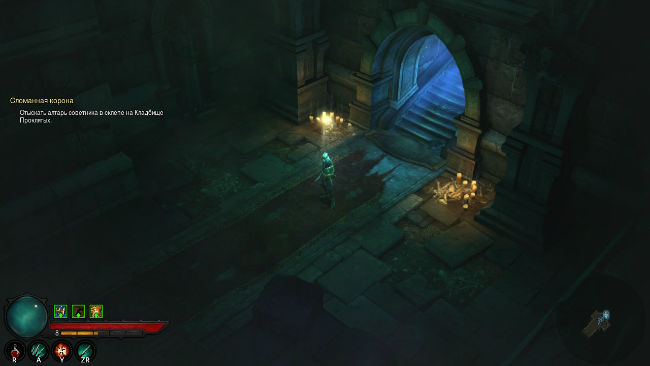 In a portable format, Diablo III: Eternal Collection looks great, delighting with clear graphics in native 720p with stable 60 frames per second and, as always, luxurious styling. The gloomy halls of dilapidated dungeons, twisted trees, the dim light of magical lights and juicy special effects – all this works fine on the atmosphere. It is worth noting that in this mode, some font seems too small, but it is still quite readable if you bring the screen closer to your face more than usual. When you play at the dock, the resolution rises to 960p , and the game looks clear on FullHD screens. On 4K TVs , ladders are already visible, while the frame rate is still kept at around 60 FPS . Detailing the image is not inferior to the versions of the game for other systems of this generation, but we noticed that the animation of the web was gone, which on PS4 and Xbox One was waving from the swords of many characters running around.